Before the age of modern dental materials, metal played an important role in almost all types of restorations. 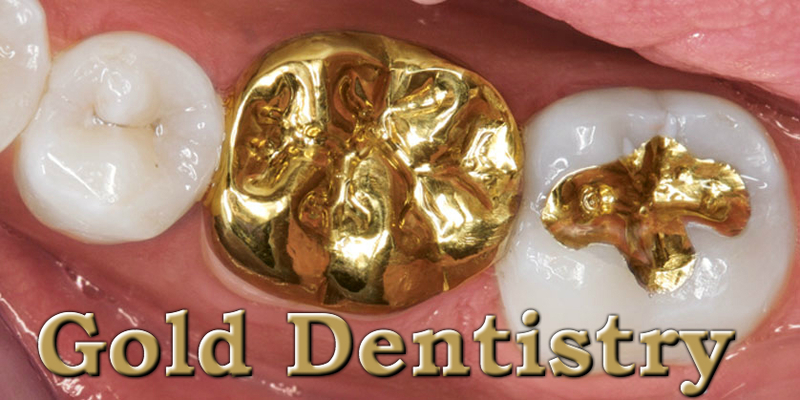 Many dentists opted to use gold for fillings and crowns for it's durability and ease of use. If you have gold dental work, you may be concerned if it's utility has been surpassed by modern technology. On the contrary, gold still stands as one of the best materials available for dentistry today. Read on to learn how and why gold was (and continues to be) a popular dental material. Gold is a very malleable metal with a relatively low melting point and high polishability. These properties make it an ideal material for replacing lost tooth structure. Molten gold readily flows into complicated molds, allowing it to be cast into a variety of shapes- including tooth crowns. Once a crown is cast, it easily polishes to a high shine surface that deflects plaque and has great adaptation to tooth structure. Gold is also highly inert, meaning it will not rust or corrode over time. In dentistry, pure gold is mixed with a variety of other metals to better control the durability, color and resilience of the final product. Today, gold is used much less frequently than previous decades. However, it still has its place in restorative dental treatment. Gold can be an ideal material for creating a crown on a tooth when only a minimal amount of tooth structure needs to be removed. However, many modern tooth colored materials have met or surpassed the qualities of gold while providing better esthetics. In short, there is absolutely nothing wrong with gold as a dental material. Still, there are many newer materials available that mimic the benefits of gold, but with better cosmetic results. If you would like to know more about gold crowns, porcelain crowns or dental materials, please give our office a call!